Arts & Crafts...for you & the kids! In almost every home I've worked in that houses either someone creative or a child, there are art supplies. It might range from your basic crayons, markers and glue to the more elaborate scrap-booking kits, sewing tables and painting supplies. As you can imagine, it's easy for these little pieces and piles of supplies to overflow any space. How can someone corral and contain them without stifling the creative flow? And, how can things be stored so they're kid-friendly? As always, the first thing to do is sort it all out. Spread out all your supplies to assess what you have. Start making piles - or categories - based on how you attack your craft projects. Should pipe cleaners be in it's own category? Or, would you only grab them when you'd also grab cotton pom-poms? If the latter, then pile them up together. It will get worse before it gets better; you've got to spread it all out to see what you have! But, it will get better. Before we contain the supplies, sift through each of those piles to pull out anything you no longer want, won't use, didn't like and so on. Toss or donate those items. Now, we can talk containers. Part of this depends on storage. If things will be put away into cabinets or onto hidden shelves, containers that can close are great. Plastic works well for labeling. Clear works well to see what's inside. 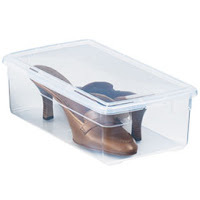 The shoe boxes at the Container Store are a great example. They can be stacked and are small enough that little ones can grab them, too. Plastic's also nice for things that can leak - like glue, paint or markers. But, really any bin that will fit your space will work. Just measure your shelf or cabinet first. Then, find a bin that suits your needs. If you'd like something a little more creative and accessible...think outside the box! 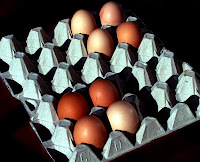 Try an egg tray for small found items. 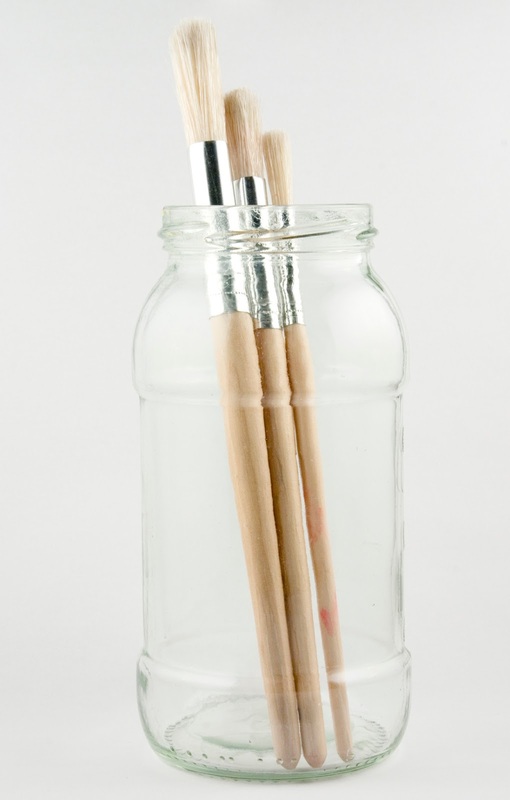 Or jars for long brushes and pencils. Use drawers or large boxes for bulkier items. You can also hang things (rope, ribbons and anything with a hole that can hang on a hook) and roll things (large paper rolls or large pieces of fabric). It's really up to you: what you have, how much you have and where you want to keep it. The important thing is to keep it all in mind. Have you done something that worked great for storing your craft supplies? Share it with me! Have you been struggling with a particular space or item? Let me know, and we'll find a solution.